I had wanted to see this in theaters, but never got to it. It’s been sitting on my DVR ever since the free weekend of STARZ came across my cable service a couple of weekends ago. Went with it last night, and boy am I glad I gave this one a shot! 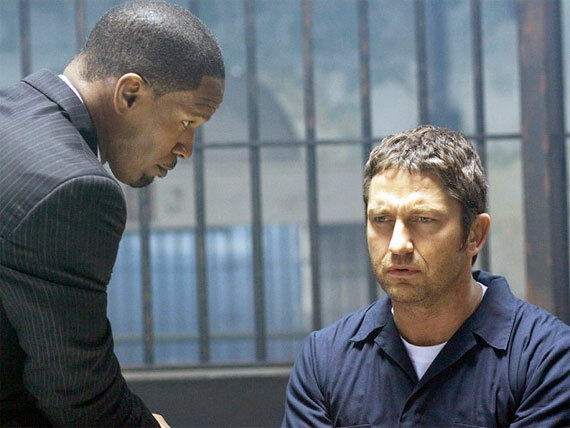 I watched LAW ABIDING CITIZEN (2009) on 7.28.10. It was my first viewing of the film. Normally, I like a trailer here. But I refuse, in this case. Having seen the film knowing little about the plot, I was blown away by the twists. Unfortunately, the trailer shows you all of them. God, that annoys the hell out of me. If you’ve seen the trailer the first act twist is not a twist at all. If you haven’t seen the trailer and you stop the movie at about the ten minute mark, right after the lawyer and the murderer share a handshake, if you try and guess how the rest of the movie will unfold… you will be wrong (how is that for horrid sentence structure?!). Some might say the first act ends after an arrest. I say it ends after a steak dinner. That’s the point at which nothing is the same. Kurt Wimmer is the writer here. He’s got some solid credits which include the THOMAS CROWN AFFAIR remake, the cult hit EQUILIBRIUM, and the decent RECRUIT. He is also the writer behind this past weekend’s latest release, SALT. He incorporates a bit of cheese into some of the dialogue, and the ending is not as satisfactory as the rest of his plot structure, but I give him credit for attacking a genre in a new way. Without giving too much away, he does a great job in role-reversal about a third of the way through this film. It’s not an easy task, and in getting it done he maybe makes some auxiliary characters a bit too one-dimensional in order to accomplish it, but it is impressive never the less. The acting here by Jamie Foxx and Gerard Butler is not revelatory, but serves its purpose for this suspense/action flick. This movie also managed to put two of my favorite character actors as major players, Colm Meaney (O’Brien from STAR TREK) and Bruce McGill. I really appreciate F. Gary Gray as a director, but don’t think this was his finest hour behind the camera. There are some nice compositions, the aforementioned arrest scene being one of them, but little which takes you out of your seat (there is a kill in the middle which absolutely does. Again, don’t watch the trailer…) . The editing in the last act leads to some time jumps which feel inorganic. Really, the movie comes close to falling apart in its last ten minutes. It doesn’t quite, because it adheres to convention enough to keep us paying attention. But it becomes clear pretty close to the end that we aren’t going to get anything revolutionary. My assessment is that this is a fairly solid R-rated thriller in a time when less of these are being made. I’m glad I saw it and, though I wish the ending had been slightly better, I suggest you give it a shot as well. ~ by johnlink00 on July 28, 2010.